Hello! Since 2014 is a brand new year, we wanted to introduce a brand new PlayStation Store program to start it off with a bang. I’m excited to announce PS Vita PLAY, our new four-week program featuring a rad lineup of PS Vita games, exclusive discounts for PS Plus members and special offers. Each week for the next four weeks on PS Store, a new PS Vita game will be released as part of the PS Vita PLAY promotion. If you are a PlayStation Plus member, you will receive a 20% discount on each PS Vita PLAY game during the launch week of each respective game. As an added bonus, anyone who purchases two or more PS Vita PLAY games from January 21st through February 17th will receive a bonus SEN wallet credit. Every week you guys find out a new way to dig into my pocket, and for some reason, I don’t mind! Awesome plus deals on VITA! Wish Gunslugs was part of the promo . . . oh well, Olliolli and Dustforce for me! I might still get it for Vita at $32 if the reviews are stellar. Not interested at all for the other indie titles listed. Buying Dustforce and TxK for sure! I’m a big fan of Tempest 2000 and cannot wait to try this one, especially at a discount. TXK should really be a Cross-Buy game. It would look awesome on the PS4 and PS3 in 3D. As much as I want to buy Minter’ s new game I don’t like playing games on a small screen. Any other sales news for next week? Not to pester, but, some video content (if any exists) my help this sale a bit. Instead of me having to go off and find them myself – not that its troublesome – for convenience. I’m on the fense currently if i want to take part in this sale. and by fense i mean fence. And toukiden is 11 – 02. Dustforce is the best precision platformer on PC as far as I’m concerned. It’s awesome to see it coming to another platform, and anyone who’s a fan of Super Meat Boy or similar titles should absolutely pick it up. I’m so excited to play it on PS Vita!! Can you ask Namco Bandai why the Vita version of Dragon Ball Z is lacking the preorder content the console versions have? Japan, and Europe is getting this stuff for Vita so it’s not like they didn’t create it for the platform. Sadly, nothing of any interest for me. Good for those excited about this. Dragon Ball Z: Battle of the Z looks awesome. I played the Demo and I totally loved it! But I’ll wait to see how T: Age of Demons looks like. Guys, please answer about digital content for Dragon Ball Z Battle of Z. Europe not only gets physical game, but several DLC for day 1. What about NA??? This would never be a problem if Sony had just made the Vita like the PS3, i.e., allowing several different region accounts in one single console…. Wow I looked at the article and recognized it and said “It’s this program supposed to be in the summer?” But looking at the article and saw O it’s the Vita version which is a first. Have to say that Battle of Z is the most appealing one to be. I would get it if my 32 gig memory card wasn’t full. Namco doesn’t care about NA. Its been obvious with their there last couple releases. One Piece Pirate Warriors 2 was digital only over here and they still refused to give us the preorder outfits that EU got. So we had to pay full price for a digital copy and still buy the ‘free’ dlc other countries got on top of it. I don’t know whats going on over there but they are insane for not offering us a preorder option on the vita version and then expecting us to later buy the dlc. Sony took some steps backwards with the ps4 as well, so its just something they do unfortunately. Glad to hear, happy Monday! I just bought 3 games last week for the vita. Does this week sale also applies to last week? Oh very nice Sony…shame that I won’t be picking up any of these games…already got an insane backlog of Vita games to play,I’ve never heard of that TxK game….and I gotta say I’m very interested on it…may end up buying it if I see a gameplay video. Only interested in Dustforce for now.. Just bought Lone Survivor and Stealth Inc from the last sale so my vita has been busy. Plus, Toukiden comes out next month so I’m set for awhile. 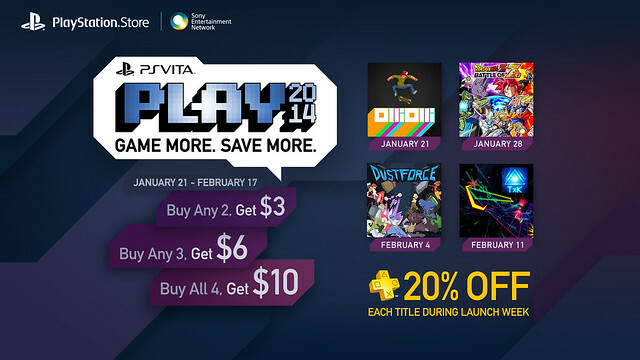 Buying all four to show my support for Vita games and Vita sales promotions like this. hey Sharon, any news about the promotion for 10 or 20 credit by spend every 50 or 100 for March with pre-order any full games for ps4 and ps3 in psn store ? Thanks Sony! For spending money I wasn’t even planning to spend. Is it safe to say that the DIgital version of the DBZ game doesnt have the Pre-order DLC, or even DLC at all? the lack of communication (not from Sony, but Bandai) just seems a bit unprofessional! Really hope some information is told soon! i would love to get this game, but if the dlc are only on ps3 ill probably just get it on that! Getting all of them…I actually really wanted DBZ…I can’t believe it has such an amazing discount! Any news on getting the Sonic racing transformed DLC to Vita? I know this aint the section..just asking! Looking forward to these games, also keep bringing Steam games to PS Vita! Can someone answer me this, what ever happen to the game/app for the vita called travel bug? Think I’m down for the 3 non-DBZ games. Not compeltely cold on TxK, but it does look like fun. Most of these aren’t Vita games, they’re Indie games playable on Vita. There are sooo, sooo many games on Vita that are only out in Asia and this is the kind of support NA gets?! I know you’ll probably never bring back pre order bonuses like the occasional 10% off plus members would get, but can we at least get pre orders of REAL ps4, ps3 and Vita games on the psn already/again?! are any games cross buy supported? Really want a Vita now that TxK is so close to release. That game looks excellent. Loved the Jaguar game. Looking at OlliOlli and Dustforce. I am not sure about TxK and I really do not understnd Dragonball anything! Well I was gonna get Battle of Z anyway (duh, look at my name), Dustforce is amazing, and OlliOlli caught my eye reading about it yesterday. Yeeeeeeeeeah might as well get ’em all. Awesome! Does the DBZ game come with the Naruto costume on Vita though? You know I’m exited for OlliOlli but I think that $10 even on sale is a lot, and I always get burnt on these sales because in a couple months time these will all be on sale here and there and be cheaper in the long run (even with the cash back program) and in like 5/6 months one will be free on plus and that would really hurt the wallet. I’m not trying to complain cuz I love you Playstation and especially PS Plus. I mean your 14 for 14 sale is pretty badass, but I need incentive with something like this. Damn, I so do wish I actually had cash right now. OlliOlli looks like a most wonderful time killer. dbz seems really out of place in this offer, but I’m not mad at it. def picking up the other three games. keep those Indies coming! But next time make those particular games 25% off. Then promote it as “From 20% to 25% off”. I need update to allow more bubbles on my Vita card. Down to three allowed. I have 97 icon bubbles already.